2018 Royal Show Guest Judge, Mr Reg Morgan (left), presents Mr Brian Karlsen with his award. 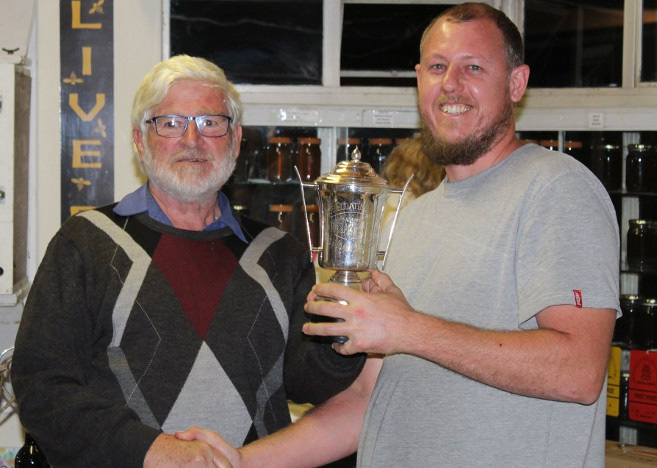 In his first year of bee keeping, Mr Brian Karlsen, a technician in the Controlled Environment Facility (CEF) at the School of Agricultural, Earth and Environmental Sciences (SAEES), received a first prize at the 2018 Royal Show for his skills in the field. Karlsen had been interested in bee keeping for several years and after finding a swarm of bees in a wet wall pump cover where he works, decided to pursue the interest more seriously; rushing off to get supplies in the hopes of capturing the swarm. After two years of attempting to catch swarms, Karlsen succeeded a year ago; removing a swarm from a hive in a friend’s canoe. Karlsen almost did not enter his honey at the Royal Show as he was concerned about the quality and quantity. However, the swarm he captured from the canoe produced an award-winning product. The entry was assessed for its colour, aroma and flavor – all of which is up to the bees says Karlsen and then assessed according to the density and condition of the bottled product. The KwaZulu-Natal Bee Farmers Association, which judges the competition, scored Karlsen highly in many of the categories, giving him full points for the flavour. They were impressed with the quality and advised him on how to improve the density and bottling. Karlsen now has two bee yards, one at the farm where he lives in Bishopstowe and another at a friend’s home in Winterskloof. For the moment, bee keeping remains chiefly a hobby, but Karlsen hopes it will eventually become a bigger part of his farming pursuits. Currently, he raises broiler chickens on chemical-free pastures and is also growing layer flock which is also pasture-fed. He is also raising a few cows and hopes to begin growing vegetable crops in the Spring. ‘I like the ecosystem approach to farming where one enterprise feeds the other, producing zero waste and requiring minimal inputs. The pastures feed the animals, who fertilise the crops, which feed and are pollinated by the bees, and in the end, we end up with vegetables, honey, chicken, milk and eggs,’ he said. Karlsen, who is creating a business out of selling free-range chickens and pure local honey, assists with bee removals during his weekends; a demanding activity during the current swarming season.